Grid and Cloud Computing models pursue the same objective of constructing large-scale distributed infrastructures, although focusing on complementary aspects. While grid focuses on federating resources and fostering collaboration, cloud focuses on flexibility and on-demand provisioning of virtualized resources. Due to their complementarity, it is clear that both models, or at least some of their concepts and techniques, will coexist and cooperate in existing and future e-infrastructures. 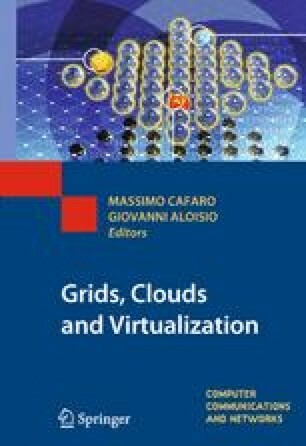 This chapter shows how Cloud Computing will help both to overcome many of the barriers to grid adoption and to enhance the management, functionality, suitability, energy efficiency, and utilization of production grid infrastructures. This research was supported by Consejería de Educación de la Comunidad de Madrid, Fondo Europeo de Desarrollo Regional (FEDER) and Fondo Social Europeo (FSE), through MEDIANET Research Program S2009/TIC-1468, by Ministerio de Ciencia e Innovación, through the research grant TIN2009-07146, and by the European Union through the StratusLab contract number RI-261552.